Great success for NaRePI 2018 meeting! The 2018 annual meeting of the Namur Research Pole in Infectiology (NaRePI) was successfully held on Friday November 30 at the UNamur. This second remarkable meeting of NaRePI was attended by 80 participants, including academics, postdoc researchers, PhD students and Master students, from various Belgian institutions (UNamur, ULB, UCL, ULiège, UMons, Sciensano…). Oral presentations were given by 8 renowned experts. Prof. Thierry Soldati (University of Geneva, Department of Biochemistry) delivered an outstanding keynote presentation on the use of the amoeba Dictyostelium as a powerful model to study cell-autonomous defenses. Prof. Laurence Van Melderen (ULB, Cellular and Molecular Microbiology) gave a fascinating talk on how, within a growing bacterial population, a small subpopulation of cells is able to survive antibiotic treatment by entering a transient state of dormancy referred to as persistence. Dr. Neeraj Dhar (Swiss Federal Institute of Technology in Lausanne) presented original single-cell approaches for elucidating the mechanisms of bacterial persistence against antibiotics. Prof. Benedikt Kaufer (Freie Universität Berlin) demonstrated how herpesviruses establish latency by integrating their genome into telomeres of host cell chromosomes. Dr. Sophie Uzureau (ULB, Laboratory of Molecular Parasitology) highlighted the ability of the human ApoL1 protein to lyse African trypanosomes and its role in renal disease. Dr. Laurent Nguyen (ULiège, GIGA Neurosciences, Laboratory of Molecular regulation of Neurogenesis) shed light on the mechanisms by which Zika virus induces microcephaly. Prof. Laurent Gillet (ULiège, Laboratory of Immunology-Vaccinology) discussed the imprint left by the gamma herpesviruses on the immune system of their hosts. Finally, Prof. David Alsteens (UCL, NanoBiophysics lab) illustrated innovative applications of atomic force microscopy to study interactions between viruses and host cells. In addition, several young researchers also actively contributed to the event, with 5 excellent short talks and 10 poster presentations. 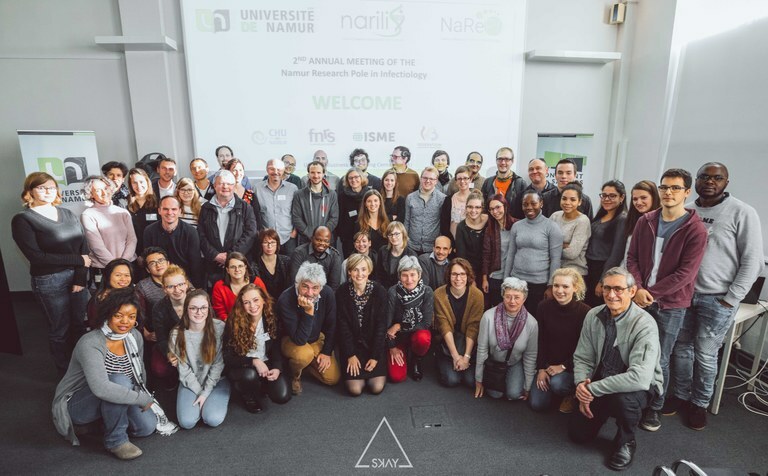 NARILIS would like to thank everyone who was involved in making this meeting a success: our brilliant speakers, poster presenters and all participants, as well as the FNRS, the Fédération Wallonie-Bruxelles and the ISME for their financial support. Looking forward to further editions!